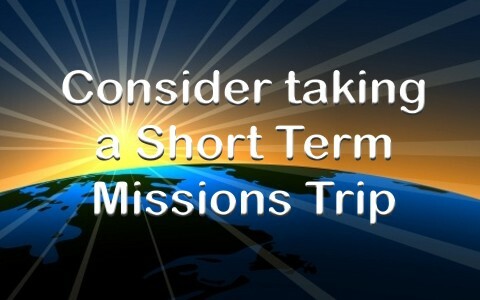 A short term mission trip can be a great experience. There are many views as to how effective these are to the work on the field, but let’s take a personal view for the next few minutes. A short term trip can forever impact the life of a believer if they are willing to allow the Lord to work in their heart during a special trip. Please allow me the privilege of being very generic for the purpose of piquing your interest in missions through this article. Instead of specific countries, I would like to tell you some of the things you can experience while taking a mission trip to each of these world regions. I have personally experienced each of these areas and know that God can work in your life through a trip to any of these locations. What a wonderful and varied continent! Varied in culture, religion, and political history. What seems not to vary in Africa is the friendliness to visitors. It may only be a surface friendliness, but you will be hard pressed to feel more welcome in any other region of the world. Religiously you cannot put all Africans into a mold. There are some countries whose dominant religion is centuries old and others that seem to have a new national religion every few years. Each time you go, even if to the same place, you may find a different political and religious culture. Africa is a continent in a constant state of change. Throughout the Americas you will find wonderful people who are religious and hungry for the truth of God. Of course that is a very broad statement and doesn’t apply to everyone, but is generally true. While I say they are hungry for the truth, they don’t always get the truth and become blinded by the traditional religions that are close at hand. Latin America particularly is typified by a strong Catholic heritage. On the surface you will find people who are willing to accept what you have to share with them. You may even be surprised to learn that the people to whom you minister already know much of what you, as a Christian, desire to teach. It is not until you get more into the specifics of what you believe will you run into any conflicts or problems. A trip to anywhere in Latin America will fill your thoughts with a rich cultural heritage and a desire to go back to the people you fell in love with. One great mistake you can make is assuming that everyone in every Latin American country will share a common culture and belief system. The only similarity between many of those countries is that they share a common language. Like Latin America, it would be a mistake to think that all Europeans are alike. It may be easier to make the cultural and historical separation in Europe because they don’t have a single language that binds them together. While Latin American culture is very old and seemingly unchanged over the last few centuries, Europe is not that way at all. Certainly each country will have its deep cultural history. But many European cultures have been greatly altered in the last 100 years. With major wars being fought on their soil and countries changing governments (maybe multiple times) the last century has been one of turmoil and victory. In Europe you have the privilege of talking with people who have lived through some amazingly miraculous events and horrifically tragic ones. Religiously there is a strong history in each country, but many are also countries in religious flux right now. Some places you visit in Europe will seem religiously dead while others are on the edge of new birth. Ask God to give you wisdom in dealing with the people there and allow Him to teach you what He wants you to learn while visiting the mission field in Europe. Generally Asia is a place that is bursting at the seams with a desire to learn about God and His Word. Certainly this is not true in every place and with everyone, but you will find that the younger people in Asian countries are seeking to know about the God of the Bible. As someone who has an interest in world mission movements, it is thrilling to me to see our friends in the Orient sending out their own missionaries to evangelize their people and the world. My only trip to the country of Haiti was to assist a Filipino missionary in his work with the Deaf. I’ve had wonderful opportunities to work alongside Korean and Chinese Christians in projects in Latin America. Of course there are many horrible religious atrocities happening in some Asian countries today. Pray that God will use these events as catalysts to share the Gospel in a greater way. Like Africans, you will find a welcoming people. However, in Asia the welcome goes much deeper than a surface friendliness. They have a genuine curiosity as to why you would visit their country. What a wonderful opportunity to share your love for God with them. While living in Argentina I had the privilege to take a mission trip to Las Vegas, Nevada. That sounds like a strange place for a short term mission trip, but it was an opportunity God gave me and a team of friends to take the Gospel to people from around the world as they were gathered for an international convention. Be willing for God to show you open doors. Wherever you end up going on a short term mission trip, keep your heart tender and allow the Lord to work in your life. Certainly you go to be a help and blessing to others. But inevitably those who go to be a help and blessing end up coming home being much more blessed and enriched. Allow God to use that time to grow in you a deeper love for people and a desire to share the Gospel with those around you and around the world. Out of these 5 regions Europe seems to be the most troubling one with respect to people’s belief. There is a widespread atheism movement in that continent. More and more people are turning their back on God. Churches no longer have enough people to attend them. But, we should never allow negativity to determine what we ought to be doing when it comes down to our God-given responsibilities. Instead we are to rely on God by allowing Him to use us for His purpose however He likes. Next post: Is Hearing Preaching or Sermons Essential To Spiritual Maturity?